Teenage girls at a city school enjoyed a glimpse of life as a research nurse at an event designed to help them plan their future. Aisling McLaughlin and Amy Bamford took time out from their busy jobs at the Queen Elizabeth Hospital Birmingham to speak to the group of 13 and 14-year-old pupils at Bishop Challoner Catholic College in Kings Heath. The pair gave presentations about their work during the school’s Raising Aspirations Day and explained why research is so important for future health care. They then invited pupils to handle some of the equipment they use when caring for patients who have suffered from a burn or other traumatic injury. Aisling, Research Sister for the NIHR Surgical Reconstruction and Microbiology Research Centre, said: “The girls were very engaging and it was a fantastic opportunity to encourage the younger generation to consider a career in either research or nursing. 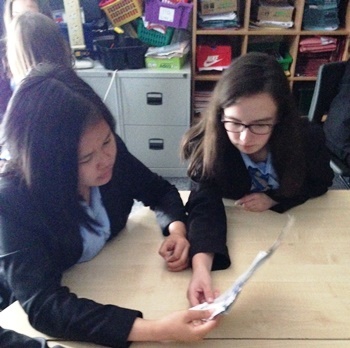 Aisling and Amy were invited to speak to students as part of the school’s ‘Raising Aspirations Day’. “I liked the ‘hands on’ element of their workshop and am keen to pursue a career as a trauma nurse,” added Sophia Pardillo, 13 (pictured above left with Amelia Hetherington). One of the event organisers, Emily McGowan, said: “We’d like to say a huge thank you to Aisling and Amy for giving up time in their busy schedules to attend our Raising Aspirations event. “The feedback we have had so far has been fantastic and I really think the girls got a lot out their workshop.